Thanks to some weak starting pitching, the Red Sox had lost two in a row coming into Saturday afternoon’s game against the Blue Jays. They didn’t get a great effort from their starter on Saturday either as Rick Porcello gave up four earned runs in six and two thirds. Despite his mediocre outing, Boston still had a chance to win this one. Xander Bogaerts cut the lead to the 3-1 in the fourth with a solo homer, extending his hitting streak to 21 games. His AL leading average is now up to .351. A two-run RBI double by Dustin Pedroia tied the game the next inning, and the Sox took the lead on a two run single by Hanley Ramirez. Unfortunately Hanley was thrown out going for two on a call that probably should have been challenged. Travis Shaw extended the lead to 7-3 with a two-run homer, his seventh of the year. Shaw is now tied for the fourth most RBI’s in the AL with 35. His seven dingers are tied for ninth. Rick Porcello’s last earned run came in the sixth inning on an RBI single by Russell Martin, which made it a 7-4 game. Like I said, Porcello wasn’t great but this loss isn’t on his shoulders. He walked off the mound with a three-run lead. That three-run lead became a four-run lead in the top of the seventh when Ramirez hit another RBI single, driving in his third run of the day to put the Red Sox up 8-4. This is when things got ugly for the bullpen. Junichi Tazawa gave up three runs in the eighth, allowing Toronto to make it a one-run ballgame at 8-7. Taz allowed an RBI single to Russell Martin, followed by an RBI double to Devon Travis to bring the Jays within two runs. He then threw a wild pitch to bring in another run before before being pulled. Next it was Craig Kimbrel’s turn. He entered the game with an 8-7 lead before Jose Bautista ripped an RBI single to right field to tie things up. He managed to get out of the inning before things got worse, but the four run lead had vanished and it was a whole new ball game. 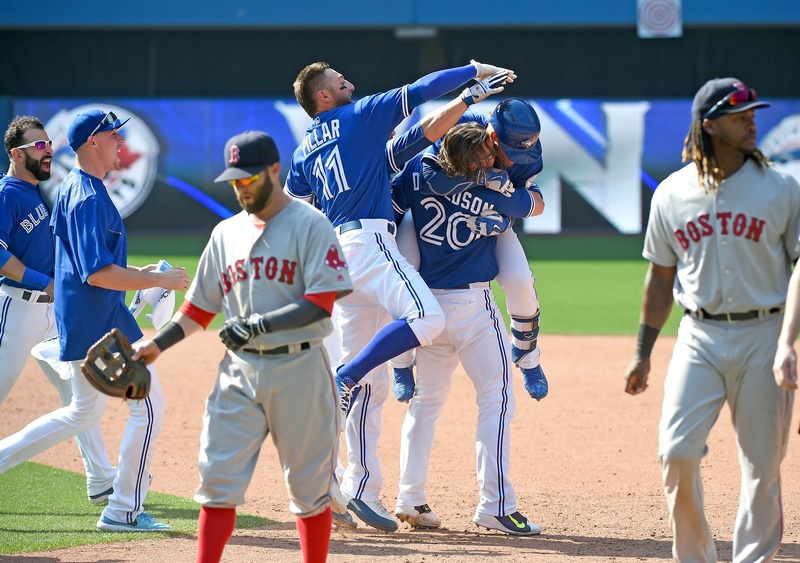 The bad news is that this great moment was ruined by yet another Blue Jays comeback in the bottom of the ninth. Craig Kimbrel came out for a second inning, which probably wasn’t the best decision by John Farrell in hindsight. The Sox’ closer surrendered an RBI double from Russell Martin to tie the game. Martin later scored the game winning run on a single from Devon Travis. The result was the third straight loss for the Red Sox and probably their must frustrating one of the year. They came back twice but still managed to blow it in the end. Fortunately they’re still a game ahead of the Orioles for the lead in the AL East. They’ll try to get back on track and avoid the sweep against Toronto on Sunday afternoon.